Hotel Africa Tunis terletak di Tunis, di Avenue Habib Bourguiba yang terkenal, 15 minit pemanduan dari Lapangan Terbang Tunis-Carthage. Ia menawarkan bilik-bilik yang kalis bunyi dan berhawa dingin dengan pemandangan panoramik ke bandar. Restoran Hotel Africa Tunis, Kilimandjaro, menyajikan masakan Mediterranean dan tetamu dijemput untuk bersantai di bar Lobby. Terdapat juga Brasserie yang terletak di teres, yang menghadap ke Avenue de Tunis. Africa mempunyai kaunter penerimaan tetamu 24 jam, serta menyediakan surat khabar percuma, penukaran mata wang dan perkhidmatan sewaan kereta. Parking peribadi percuma disediakan di lokasi dan tetamu boleh menerokai medina dan souk tempatan di Tunis. Tasik Tunis berjarak hanya 5 km. The door and AC in my room were broken. Despite repeated repair attempts, the AC merely pushed lukewarm air weakly. The door shorted out and the passcard did not work. Had to descend twice 20+ floors to request help then wait until a repairman arrived. But the worst and unforgivable aspect was how black guests were treated. Each time I saw black people enter the hotel, immediately staff pounced on them and asked to see their pass cards. My own colleague joined me and no fewer than 4 staff converged on him, each asking to see his pass card. All within 10 seconds of entering the lobby. I mentioned this to the front desk and they said, "this is for security". I asked why no one asked me, they replied, "it is obvious that you are a guest here." Meanwhile, white and Arab guests pass unbothered and no one requests them to prove they are guests. They were also rude to my colleague. When I raised it as something they could perhaps look into, they only argued. This is racism. 100% AVOID!! Poor hotel it is one star hotel+A/c is not working,breakfasy is poor. Staff are very helpful and friendly. Location is superb, right on the main street in the Ville Nouvelle. I would stay again and again in this hotel. i would like to stay again here. Its expensive for the room facilities and standard of the hotel. Although they say 5 star, it has no pool. The day I reach hotel, a demonstration was going on in front of hotel and was advised to stay in. Hotel has car service with driver to travel around the city. Nothing really, I will come stay here again! Very well located. 5 minutes walk to the traditional Souk. 15 minutes taxi from Airport that costs you 2EUR. 20 minutes from Sidi Bousaid (must see), taxi 3-4EUR. Internet is about 10 EUR per day. The breakfast is very good and the people are very nice. 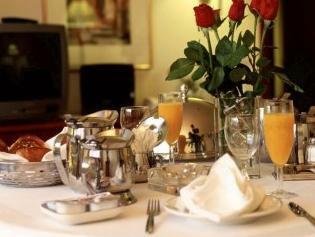 Breakfast (natural orange juice), rooms, location. 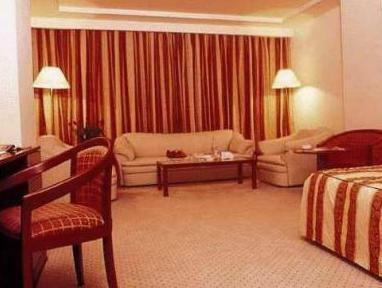 The hotel is very well located right in the main street in center Tunis. The staff was very helpful and the breakfast was very good. They offered me a suite and it was very nice and spacious with main room, 2 bathrooms, dressing room and living room. Only disadvantage is that Cable internet and wireless internet are not free of charge. the break fast privided by hotel was quite good. generally speaking hotel services is very good considering the price and the location is good for business trip. Nice location. High standard. Friendly. I enjoyed it. The hotel is overall nice. The food was excellent and the staff very friendly. 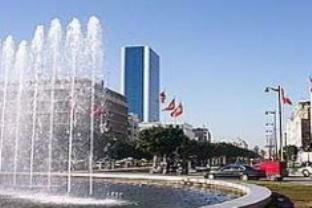 The location is also great, just in the centre of Tunis. Quiet even though it is a downtown hotel. Close by shops and the old market. Clean enough. 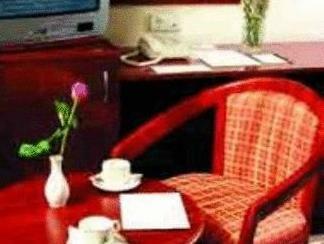 Personnel at front desk not cheerful enough, rooms are relatively small, and TV's are old. Relative to 4 star hotels in Dubai for example, this hotel is no more the 3 stars but advertised as a 5 star. Area is not tourist friendly especially at night. Food such as fruits and vegetables ingredients not the freshest in Tunisia. Some staff especially in front desk do not sound and look very helpful. the africa hotel situated in center of tunis, in boulvard habib bourguiba. near to everywere shoping center,coffe bar and all taxi and train staition,so easy to go or come from airoport tunis cartage just about 20 min and they cost you just 5 tunisian dinar maximum. you reach to hotel all the staff are good,they talk nicelly and with 3 or 4 language,arabic,french,italian and english. the rooms are so clean with every things inside internet with money and the speed is good. i hope for all the travelers to have a nice days in africa hotel and in tunisia. This hotel has the best location and is an easy flat walk to the Medina, the shops.Taxi is just 4 dinar to the airport from the hotel and takes only about 15mins. To see the other sights like the Carthage ruins etc is also an easy and cheap taxi ride. The staff are friendly, helpful and speak very good english and french. It was a good comfortable hotel to come back to after a long day.